Eskandari, M., Zarei-Hanzaki, A. (2011). Effect of Deformation Temperature on the Mechanical Behavior of a New TRIP/TWIP Steel Containing 21% Manganese. International Journal of Iron & Steel Society of Iran, 8(2), 16-19. M. Eskandari; A. Zarei-Hanzaki. "Effect of Deformation Temperature on the Mechanical Behavior of a New TRIP/TWIP Steel Containing 21% Manganese". 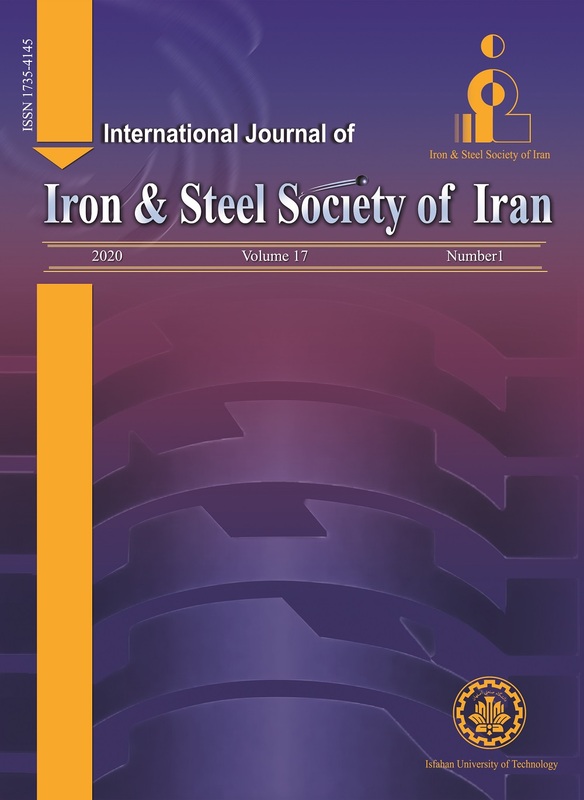 International Journal of Iron & Steel Society of Iran, 8, 2, 2011, 16-19. Eskandari, M., Zarei-Hanzaki, A. (2011). 'Effect of Deformation Temperature on the Mechanical Behavior of a New TRIP/TWIP Steel Containing 21% Manganese', International Journal of Iron & Steel Society of Iran, 8(2), pp. 16-19. Eskandari, M., Zarei-Hanzaki, A. Effect of Deformation Temperature on the Mechanical Behavior of a New TRIP/TWIP Steel Containing 21% Manganese. International Journal of Iron & Steel Society of Iran, 2011; 8(2): 16-19. In recent years, TRIP/TWIP steels have been the focus of great attention thanks due to their excellent tensile strength-ductility combination. The compression tests were performed at different temperatures from 25 to1000°C to study the mechanical behavior of advanced austenitic steel with 21% manganese plus bearing Ti. The results indicated that the plastic deformation is controlled by deformation-induced martensite and mechanical twinning from 25 to 100°C. However, at temperatures 200 to 1000°C the deformation twinning was merely observed. The occurrence of mechanical twinning at such high temperatures is a ﬁrst-time observation in high manganese austenitic steels. Such mechanical twins led to grain refinement via grain partitioning. Vagheﬁ: Mater. Lett., 64(2010), 15. O. Grassel, L. Kruger, G. Frommeyer and L.W. Meyer: Int. J. Plast., 16(2000), 1391. G. Cailletaudd: Int. J. Plast., 16(2000), 723. M. Karimi: Mater. Des., 30(2009), 3869. Steel Res. Int., 82(2011), 45. Mater. Sci. Eng. A, 46(2009), 46. Metall. Trans. A, 40(2009), 2241. Metall. Trans. A, 28(1997), 2405. D. Hao, D. Hua, O. Chun-lin, T. Zhang-you, Z.
Ian-mirr Z and Y. Ping: Iron Steel Res. Int., 18(2011), 36. D. Hao, D. Hua, S. Dan and T. Zhengyou: Mater. Sci. Eng. A, 528(2011), 868. X. Zhao: Mater. Sci. Eng. A, 527(2010), 432. M. H. Yoo: Metall. Trans. A, 12(1981), 409. M. J. Marcinkowski and D. S. Miller: Philos. M. Fujita, Y. Kaneko, A. Nohara, H. Saka, R.
Zauter and H. Mughrabi: ISIJ Int., 34(1994), 697.
and Y. I. Chumlyakov: J. Mater. Res., 19(2004), 2268. I. Karaman, H. Sehitoglu, H. J. Maier and Y. I.
Chumlyakov: Acta Mater., 49(2001), 3919.